The Bluetooth and aquabus version of ther farbwerk can have all outputs controlled via Bluetooth, additionally all sensor inputs are available via Bluetooth. This requires a Bluetooth device as well as an app. Aqua Computer currently supplies a basic Android demo app (compatible with Android 4.4 KitKat or higher) including source code that can be used to set the outputs of the farbwerk. Other mobile operationg systems are not supported! All features of the aquabus version are available as well. As a matter of course, this version can also be used as an USB device without Bluetooth or aquabus connection. Kann die Beleuchtung auch bei heruntergefahrenem Rechner über Bluetooth (Android-Smartphone) geregelt werden, bzw. in welchen Betriebszuständen muss der Rechner sein? Das wird so nicht funktionieren da die Farbwerk mit Strom versorgt werden muss. Wird der Rechner heruntergefahren, ist 0V auf der Leitung. Can I control multiple Bluetooth units with single smartphone? For that question, please ask Aqua Computer. We do not have that information, sorry. Then, is this compatible with this? 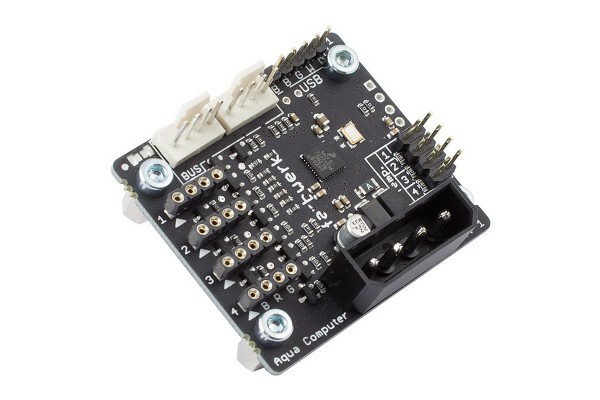 http://www.aquatuning.fi/ilmajaeaehdytys/controllers/11311/aquacomputer-aquaero-5-lt-usb-fan-controller or do I need Auquaero 6 Pro or something? It is compatible to all Aquaero 5 and 6, also the 5LT. Wo kann ich hier die erwähnten Temperatursensoren anschließen? Rechts neben dem Molex-Anschluss befinden sich acht kleine Pins die auch seitlich mit 1, 2, 3 und 4 nummeriert sind. Hier können sie 2-Pin Sensoren anschließen. Nein können sie nicht. Da wir keine EK Produkte führen und führen werden, können wir Ihnen hier leider keine weitere Hilfe anbieten.